Swimming is a favorite pastime for many people around the world. 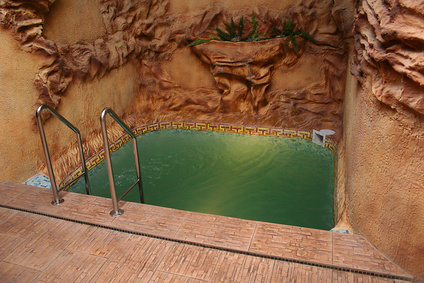 Pools also can be used for therapy if a person has a physical ailment. Getting into a pool can be challenging for children or older individuals. You can buy a ladder for your pool that will allow people to enter and exit without needing assistance. If you have basic handyman skills and want to save money, you can build a ladder yourself. Select the exact place on the pool wall where you want to install the ladder. Using a tape measure, take a measurement of how deep the pool is at that place. Write down the number on a piece of paper and add 3 feet to that number. This is the amount of pipe you'll need to build your ladder. You'll also need at least six pieces of pipe that are 3 feet in length. These pieces will be used as steps. Buy two pieces of pipe that are the length you wrote down in Step 1, including the extra 3 1/2 feet. The pipes should be 2 inches thick. If you can only find longer pieces of pipe, ask the employee at the hardware store to cut them down to the size you need. Curve one of the pipes to a 140-degree angle on one end. Do this 1 1/2 feet from the end of the pipe, using a pipe bender. Repeat this same procedure with the other pipe. These curves will allow you to rest the pipe on the wall of the pool. Flip the pipes over and curve the other ends. This side of the pipes will lie on the bottom of the pool floor. Use the pipe bender to bend the ends on a 50-degree angle. You'll need to calculate how far from the ends of the pipe to bend them so the pipes will still rest on the ground when the tops are bent over the wall of the pool. Remove the pipes from the pool. Put on welding goggles and weld a 3-foot pipe piece between the two vertical posts 3 inches above where they would touch the bottom of the pool. This will assist in stabilizing the ladder. Take the pipe pieces that you plan to use for your steps and spot-weld them horizontally between the two long pipes at 11-inch intervals. Make two holes that are 6 inches in diameter each, and 8 inches deep where the top of the ladder meets the cement that surrounds the pool. Use a chisel and mallet to accomplish this task. Slide the two curved tops of the ladder pipes into these holes. The ladder should be flat against the inside wall of the pool with the bottom of the ladder touching the bottom of the pool. Mix 2 pounds of concrete with water in a plastic bucket with a spade. Pour the concrete into the holes you made in step 7. Allow the concrete to dry for 24 hours before using the ladder. You can rent a steel pipe bender from most hardware stores if you don't own one.